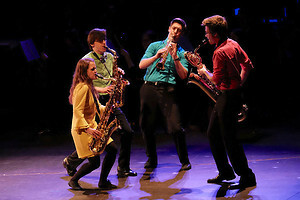 With performances by students from the schools of Music, Design & Production, Drama, and Filmmaking at the University of North Carolina School of the Arts (UNCSA), the third annual Collage Concert is a musical feast sure to leave its audience giving thanks. Collage will feature selections by the UNCSA Symphony Orchestra, Wind Ensemble, Jazz Ensemble, Percussion Ensemble, Cantata Singers, and Fletcher Opera Institute; solo and small ensemble performances; and the senior class actors. An animated film and an electronic music composition with student-designed LED costumes garnish the menu for the concert, to be presented at 7:30 p.m. on Saturday, Nov. 18, in the Stevens Center. Tickets are $18 regular and $15 student and are available online or by calling the box office at 336-721-1945. "Collage is a taste of the very best of what we do at UNCSA," said Artistic Director Christopher James Lees, who will conduct the Symphony Orchestra for four selections. "With Collage, we peek into the campus' many practice rooms, rehearsal halls, workshops and classrooms. Actors and animators tell their emotionally charged stories, all within the brilliant imaginations of designers and production specialists." The Symphony Orchestra will accompany a screening of the 2017 animated film "Supernova," directed by 2017 Film alumni Gavin Lankford and Aleksandre Kosinski, performing the original score by Alex Umfleet, a 2017 graduate of the School of Music who is working toward a graduate degree in Film Music Composition. An original electronic music composition by undergraduate student Kyrie Antoinette provides the backdrop for LED costumes designed by Trent Pecnicni, a graduate student in the School of Design and Production, and modeled by undergraduate costume designers Lauren Pennebaker and Taylor Newell. Members of the senior class of the School of Drama will perform musical theater selections from their upcoming showcases in Chicago, Los Angeles, and New York. In addition to the film score, the symphony also will perform Intermezzo from "Cavalleria Rusticana" by Pietro Mascagni, "Variations on a Shaker Melody" by Aaron Copland, and "Dance of the Tumblers" from the Snow Maiden by Nikolai Rimsky-Korsakov. John Beck and Peter Zlotnick direct the Percussion Ensemble performing "III. Carnival" from Calle Antillana by Andrew Lazaro, in a tribute to American citizens in Puerto Rico who are rebuilding after Hurricanes Irma and Maria earlier this fall. Mark Norman conducts the Wind Ensemble for Steven Bryant's "Ecstatic Waters," Dimitri Shostakovich's "Galop," and Michael Daugherty's "Ladder to the Moon," featuring faculty artist Kevin Lawrence, violin. The Cantata Singers, conducted by Nathan Zullinger, will perform "Dirait-on" from Les Chansons des Roses by Morton Lauridsen, and "Videntes stellam" from Quatre motets pour le temps de Noel by Francis Poulenc. Jazz Ensemble selections include "Parisian Thoroughfare" by Bid Powell, arranged by Mark Taylor, and "Chachanita" by Michael Philip Mossman. Ronald Rudkin directs. Tenor James Smidt, a fellow in the Fletcher Opera Institute, will perform "Dein ist mein ganzes Herz" by Franz Lehár, with pianist Angela Ward. Lees, who founded the Collage Concert at UNCSA, said he was inspired by the talent he found throughout UNCSA's conservatory programs. "I spent my first year at UNCSA talking with teachers and students from all across the campus. The more I learned about the variety of expertise in so many arenas, the more it became clear that Collage could be a unique forum in which to showcase the breadth of talent that is nurtured here," he said. The Collage format – which shifts from genre to genre and places performers in various areas of the Stevens Center – allows for multidisciplinary projects, he said, adding "the community responded well to this idea, so we are back with even more exciting collaborations and content this year." Also on the program are a performance by the horn studio directed by faculty artist Maria Serkin; an original composition by Nick Karr, an undergraduate in the School of Music; harp, saxophone, cello and guitar solos; and several small ensembles.